Spiritual Master for the Sandhya Maarga Mission and the founder of the Sandhya Maarga Yoga system, e-magazine Holistic Living Annex, Sandhya Maarga Holistic Living Academy, and international speaker and author Genevieve Tan Shu Thung was invited to the Philippines to provide several lectures in conjunction with this year's annual conference organised by the Philippines College of the Advancement in Medicine. Themed "The Power of Natural Healing", the conference was intended to serve as a platform to promote the effectiveness of the different forms of alternative medicines amongst the people from different parts of the world. 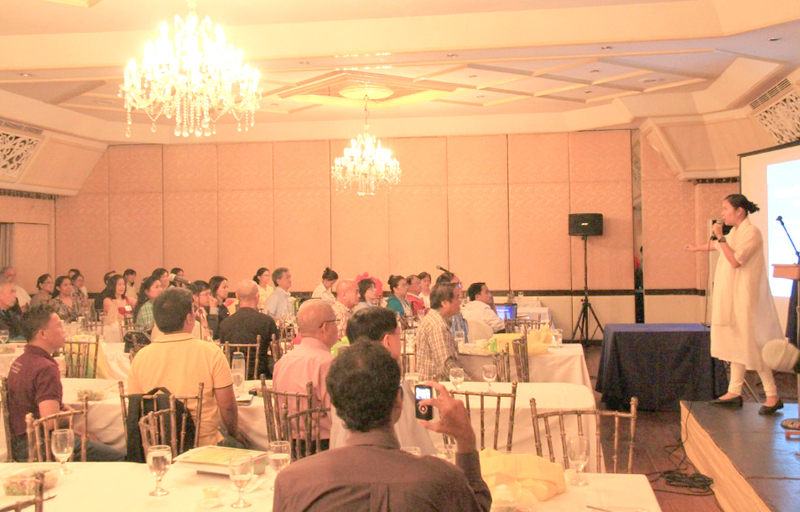 The video in the above is the recording of the workshop for a smaller group of people on the 11th of November 2013 at the Gabaldon Room (Club Filipino, Manila). The workshop began with a short introduction to the principles and philosophy of vibrational / energy medicine followed by a detailed description on the nature of the mind and how it affects our physiology. The lecture then proceeds to discuss the different case studies as to how people were relieved from their ailments solely by identifying the psychosomatic root and re-organising their thought patterns. Using the Sandhya Maarga Meditation Technique official audio guide, the entire lecture ended with a meditation session. Video by the Philippines College of the Advancement in Medicine Inc. Your presentation was so great, we learned a lot regarding visualization. God bless you more with more success to follow for the world to benefit on your wisdoms. It was a very good conference indeed. I enjoyed your lecture the most Dr. Genevieve. I travelled all the way just to attend your talk. I look forward to travelling to Malaysia with a group of people to have intensive training on this technique just as we have discussed in Manila. I liked the yoga that we did at the kalayaan hall for the plenary. I'm so sorry I had to miss this workshop because of work. They shouldn't put the important workshops on a week day.. The organizers should have put your workshop on a weekend so we can have the full day with you. But I'm happy that I still get to see the workshop through this video. love you dr.!! best speaker there. i missed you po!! i like your simplicity. stay the way you are dr. There is so much that we can do for the world. I've been practicing meditation for more than 10 years and I must say I never got to feel what I felt when we meditated as a group in the hall the other day during the plenary. It was so different than when I usually meditated on my own. Listening to the way you guided the meditation session with your voice made meditation so simple. The vibrations were so uplifting on that day when everyone joined in the session. I believe there are more things we can do for our world solely with the power of meditation. I’ve finally found my teacher. You. Thank you. Master Gen. It was a pleasure meeting you in Manila. Your presentation was the clearest and most systematic one. You helped us understand what you were teaching us in such an organized way. Thanks for spending time with us and we'd love to see you again soon. I just finished watching the video. I may not understand it fully but it got me thinking. Will write back once I got all these figured out. She's quite inspirational as a speaker. I feel her aura and vibes when coming close to her during her talk in the UK. Amazing woman.